The 2009 Lincoln Cent will feature four different reverse designs as a way of celebrating the 200th anniversary of the birth of Abraham Lincoln and the 100th anniversary of the Lincoln Cent. 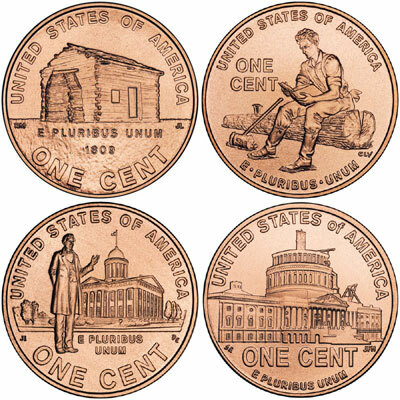 Log Cabin Penny – depiction of a log cabin representative of Lincoln’s humble beginnings. This reverse was designed by Richard Master and sculpted by Jim Licaretz. Formative Years Penny – depiction of young Lincoln reading a book to educate himself between splitting rails. This reverse was designed and sculpted by Charles Vickers. Professional Life Penny – depiction of professional Lincoln standing before the Illinois State Capitol. This reverse was designed by Joel Iskowitz and sculpted by Don Everhart. Presidency Penny – depiction of the half completed Capitol Dome. This reverse was designed by Susan Gamble and sculpted by Joseph Menna. The obverse design of the Lincoln Cent will continue to use the bust of Lincoln designed by Victor D. Brenner. The first design will be released on Lincoln’s birthday February 12, 2009. The US Mint will also create special collector’s versions of the coins struck in the original composition of 95% copper and 5% tin and zinc. These 2009 Bronze Lincoln Cents will be included in annual sets issued for collectors and a special five coin set incorporating the 2009 Lincoln Commemorative. In the following year, the 2010 Lincoln Cent will feature a new reverse design emblematic of Lincoln’s preservation of the United States as a single and united country. This new reverse design is expected to be used for the foreseeable future, replacing the prior Lincoln Memorial reverse.